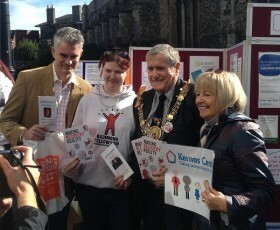 On Thursday 8th October Kernos Director Chris Boatwright (right) and other Kernos staff were present on the World Mental Health Day stall in Sudbury with the Member of Parliament for Suffolk South, James Cartlidge (left) and the Mayor of Sudbury, Cllr. Jack Owen (second right). The aim was to publicise World Mental Health Day (Saturday 10th October) and to raise awareness of what needs to be done to ensure that people with mental health problems can live with dignity. One in four adults and one in ten children are likely to have mental health problems in any one year – but an outdated stigma exists around mental health that can make it difficult for some to seek help. Only about a quarter of people with mental health problems in the UK receive ongoing treatment, leaving the majority grappling with mental health issues on their own, seeking help or information and dependent on the informal support of family, friends or colleagues. More information about World Mental Health Day and the Mental Health Foundation can be found here.